The Australian foreign minister covers a lot of ground during a brief visit to Tehran. Australia’s ties with Iran have seen a boost this weekend just passed. Foreign Minister Julie Bishop used her 36-hour trip to Tehran – the first high-level Australian visit to Iran in more than a decade – to cover a lot of ground: repatriation of some asylum seekers, nuclear issues, and intelligence sharing between the two nations. It is this last point that is the most important and unusual. Iran will share intelligence gathered from its operatives fighting in Iraq with Australia. This would have been unthinkable a few years ago, but Iran’s greater willingness to make some concessions on its nuclear program in return for the lifting of sanctions, a measure of liberalism under President Hassan Rouhani, and the expediency of new alliances in the face of Islamic State threats have helped to drive new and closer ties. Bishop believes Iran has credible information to offer on Australians fighting for the Islamic State in Iraq. “They are very present in Iraq. The [Iranian] Revolutionary Guard is on the ground, they are working with the security forces. They are carrying out operations in Tikrit and elsewhere, they are all over the place,” she said. “It’s in our interest to gain as much information as we can on those Australians who are seeking to take part in terrorist activities in Iraq and Syria and beyond,” she added Monday night. At the end of last year “Sheik” Man Haron Monis took a café full of people hostage in central Sydney, resulting in the loss of three lives, including his. He was in fact an Iran national wanted for extradition back to Iran to face fraud charges, though he also had a long criminal history in Australia. This has been mentioned in relation to new information sharing plans, though given that Iran had already asked for his extradition and many in Australia’s Muslim community had expressed doubts about him, it’s worth questioning how a deal such as this could have changed much. 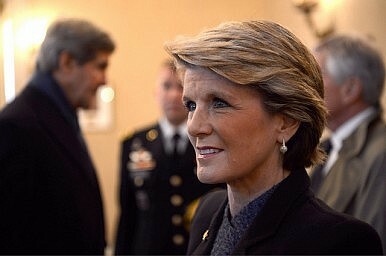 Bishop’s tenure as foreign minister has been marked by a desire to combat terrorism, addressing the United Nations Security Council on foreign and domestic terrorism issues when Australia finished its non-permanent membership last year. Domestic counter-terrorism efforts have been ramped up, with a tranche of new measures. Metadata retention laws were recently passed by parliament despite ongoing privacy concerns and ISPs’ annoyance at the possible costs to their businesses. Not all are thrilled by closer ties in this new “Axis of Expediency.” Human Rights Watch publicly called for Bishop to bring up human rights abuses during her visit. “This rare visit is a golden opportunity for Australia to demonstrate its concerns for Iranians’ human rights,” said the organization’s Australian Director Elaine Pearson. There has been little mention of human rights or Iran’s use of the death penalty in Bishop’s visit, though a country brief paper put out by the Department of Foreign Affairs and Trade last year states Australia’s concern over human rights and the death penalty. However conservative columnist and TV pundit Andrew Bolt did take exception to Bishop’s wearing of a head scarf and a hat during her visit, saying that she should have stood up for “Western values.” She was, Bishop said, asked to wear a headscarf, and complied. Independent Member of Parliament Andrew Wilkie, from Tasmania, is openly critical of any intelligence-sharing plans with Iran. Wilkie has a background in intelligence and was scathing of the plan Monday night, saying, “it’s complete and utter madness from a security point of view. They are also experts at disinformation and we’ve seen this time and time again, when the regime in Iran will tell people whatever they want us to believe.” He said some intelligence he saw come out of Iran was “crap” and “misleading” and possibly also gained via the use of torture. There has been little more credible information provided as to just what intelligence sharing might mean, or what Australia will offer in return. More sources of information from the Middle East would doubtless be useful as more Australian nationals travel to join the Islamic State. Last week former Australian model Sharky Jama was confirmed killed, taking the toll to a reported 30. In fact, Australia’s closer ties with Tehran are not especially surprising. The Lowy Institute’s Middle East expert Robert Shanahan said that the West’s relations have reached a point where it can deal with Tehran directly, and not via third-party envoys. Another issue touched on only tangentially is trade: Should sanctions be lifted in the future there may be trade opportunities for Australia. Exports to Iran from Australia last year totaled A$302 million ($234 million), despite sanctions.